Frances Irvine, left destitute in the wake of her father’s sudden death, has been forced to abandon her life of wealth and privilege in London and emigrate to the Southern Cape of Africa. 1880 South Africa is a country torn apart by greed. In this remote and inhospitable land she becomes entangled with two very different men—one driven by ambition, the other by his ideals. Only when the rumor of a smallpox epidemic takes her into the dark heart of the diamond mines does she see her path to happiness. But this is a ruthless world of avarice and exploitation, where the spoils of the rich come at a terrible human cost and powerful men will go to any lengths to keep the mines in operation. Removed from civilization and disillusioned by her isolation, Frances must choose between passion and integrity, a decision that has devastating consequences. I can’t pretend for an instant that being a reviewer at Novel Escapes is a tough job; it is completely fabulous, but every so often a book comes along that has me almost chuckling to myself with glee and rubbing my hands together at my good fortune in fooling someone into letting me in on the act. The Fever Tree is one of these books. Surely somebody is going to make this fantastic book into a film? It has it all; a personal struggle against hard times, a haunting historical context, and a love story all set against a backdrop of the beautiful South African landscape. That said there was for me a brief wobbly moment. Early on Frances has a romantic encounter on the voyage over to South Africa and for a while I thought The Fever Tree was going to descend into a tacky bodice ripper yarn, which is just not my thing at all. Thankfully this escapade was short lived, and I was so very glad I had persisted as this book delighted me on every level. I particularly enjoyed watching Frances’ eyes being opened to the world around her. She is not an endearing person at the outset; a charmless mixture of selfishness and naivety, but watching her change was gratifying. 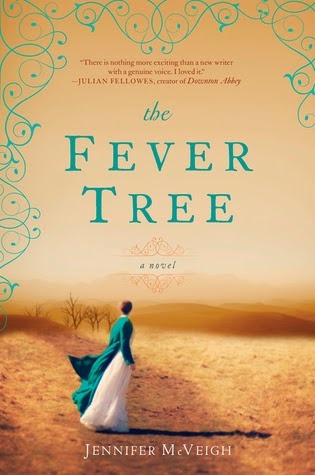 The Fever Tree is hugely ambitious first novel with an epic scope both emotionally and geographically but McVeigh assuredly crafts a beautiful and heart rendering tale and I can’t wait for her next offering. Thank you to Amy Einhorn Books for our review copy. All opinions are our own.